Most vehicles on the road today have headlights that have been designed with polycarbonate plastic. Polycarbonate plastic is a durable material that can handle harsh road conditions but, as with most structural materials, will eventually wear out due to constant exposure to the sun. No matter how well you try to maintain the condition of your headlights, they will eventually start to look cloudy. Read on to find out about some effortless ways to protect and clean your headlights. Why do my headlights become hazy? Remember when you first bought your car? Remember how clear and bright the headlights were? Getting your headlights back into their original shape is not too difficult a task and you’ll be able to get your headlights shining brightly in no time at all. As previously mentioned, your headlights will naturally turn cloudy or develop a yellowish tinge with time. This natural wear and tear happens because the polycarbonate plastic in your headlights starts to oxidise after continuous exposure to the sun’s potent UV rays. To protect your headlight film from becoming too damaged from natural degradation, it’s in your best interest to ensure that you take the time to regularly clean your headlights. Keeping your headlights clear will not only keep your car looking more aesthetically pleasing to the eye, but it will also help you increase visibility levels in low-light conditions. This is particularly vital in situations where you are driving in the evening. Having more visibility of the road, especially during times when it is difficult to see, helps to increase levels of safety for you, your passengers, and other road users. And the following cleaning methods will help you to preserve your headlights when used regularly. 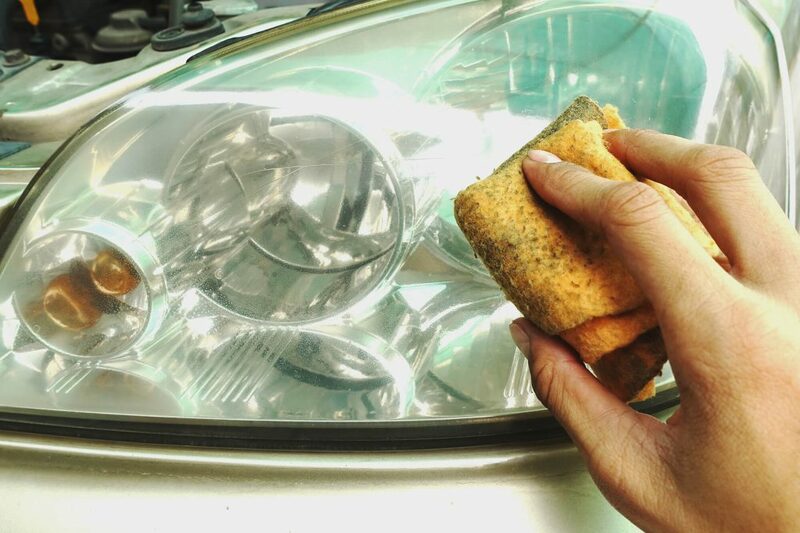 This method of cleaning headlights is very common, as many households already have the necessary cleaning ingredients. Make a mixture of baking soda and vinegar and – using a clean microfiber cloth – rub the combination over your headlights, and then simply give your headlights a rinse. If necessary, repeat the process until you are happy! Another effortless way to bring back the shine into your headlights is by using toothpaste and a toothbrush. Give your headlights a quick rinse to start, and then coat the headlights with a thin layer of toothpaste. Just like when you brush your teeth, brush over the headlights in small circles and remove any built-up grime. Once you are happy, rinse off any residue. To add extra cleaning power, try adding some baking soda to the toothpaste! After rinsing your headlights with warm water, use some finely gritted sandpaper to remove any oxidisation on your headlights’ plastic. Start off with some lower levelled grit paper and work your way up to higher levels, if needed. For the sandpaper to work, you must also soak the sheets in water. The more cleaning that is necessary, the higher the grit paper should be, but always remember to start off with the less powerful grit paper first!